Peranakan desserts and snacks are such a large and colourful collection of delectables that they warrant special attention on their own. Being a unique group with members from such different backgrounds and rich heritage, the sweet and savory treats which signify the Peranakan community are exemplary of this wonderful diversity. Look closely, and one would be able to identify easily the cultural elements from the origins of forebears where the Peranakan roots developed from. Just to name a few, we have Kueh Koo Merah and Popiah from the Chinese, Rempah Udang, Pulot Inti with Malay-Indonesian influences, Pang Susi and Kueh Blanda with Portuguese-Dutch origins and of course Roti Babi from the proximal colonial links, and these are only a teeny tip of the iceberg of the repertoire affectionately known as “Kueh Chuchi Mulot” to the babas and nyonyas. Many of these kuehs apart from tasting really good, are symbolic with their cultural significance tightly woven into the customs and practices of the Peranakan tapestry of life in the yesteryears. Some are prepared specially for specific occasions, like kueh bakol for the Chinese New Year, and were enshrouded with much mysticism through a relay of “patangs” (taboos) which had to be observed to strict accordance for guaranteed success in their making. 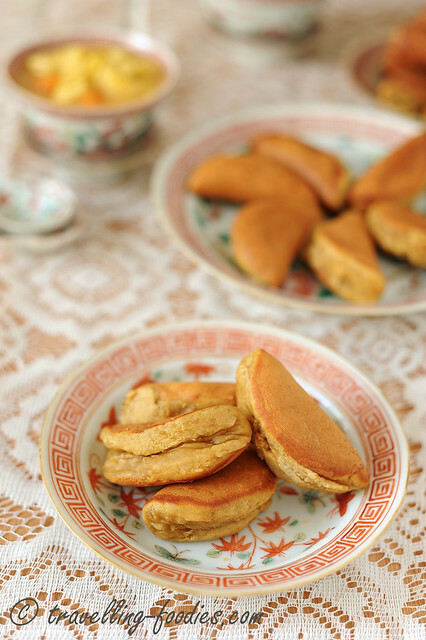 Some like kueh koo itam were made almost exclusively for ancestral worship and serving them during other joyous or celebratory events would only invite “koosmangat!” from the nyonyas with their overtly animated and dramatised “terpranjat” look, not forgetting a string of gossips that would soon follow and before long the extended family or even the whole community would know who “kentot“. Many of these kuehs, like kueh koo, kueh sarlat (gading galoh), kueh lapis beras (kueh genggang) are “colour coded”, so it mattered to many Peranakans “what” to serve “when”, to “whom” and in “which colour”. Like many of the earlier mentioned kuehs with specific “functions”, apom balek is no exception. Apom balek is a much loved kueh by members of the Peranakan community, commonly served during traditional Peranakan weddings alongside other delectables like kueh dadar, looks quite different from the similarly named ones made by the Malays, or the Chinese “ban chiang kueh/min chiang kueh“. Essentially a pancake, the kueh after just cooked is ceremoniously folded in halves, thus giving rise to their name. 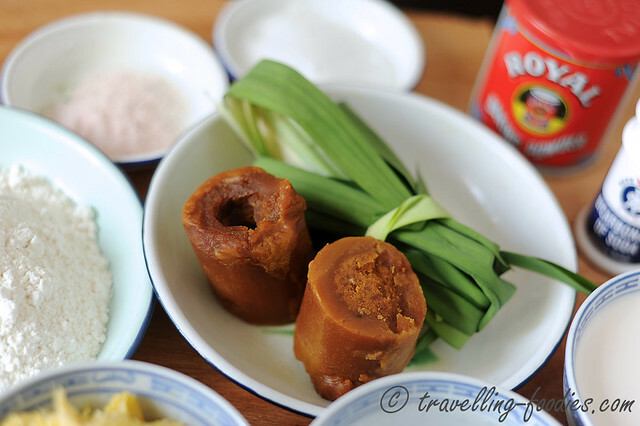 Apom balek in Singapore and Malacca are made from regular tepong gandum, compared to Apom berkuah aka apom bokwa which uses rice flour. In the latter, the rising agent is ragi (yeast) with ayer klapa (coconut water), though it was done traditionally with fermented toddy. For apom balek, baking powder is used instead alongside a bit of bicarbonate of soda aka baking soda to make the kueh more tembam, i.e. soft and fluffy. That said, I do know some babas and nyonyas who do make apom balek with yeast in place of baking powder. The texture derived would be slightly different. 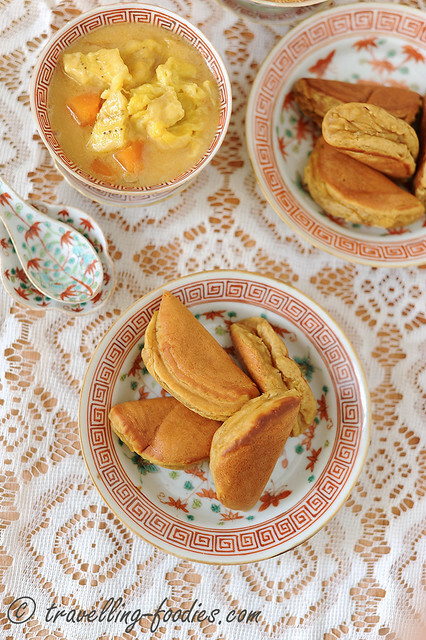 Note that the Penang form of “Apong Balik” is more similar to the original Indian appam which uses rice flour with yeast and thus different from the ones prepared by their cousins in the south. 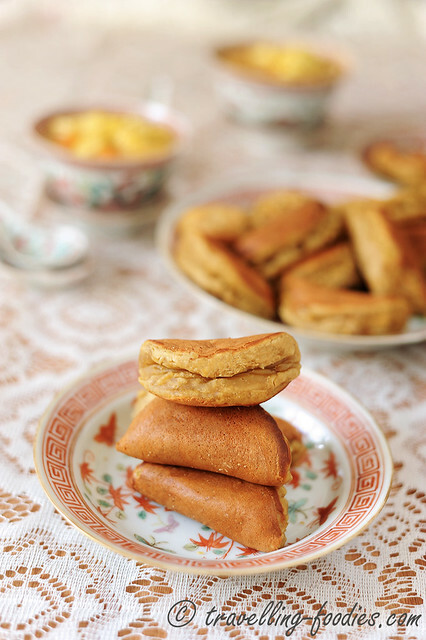 Apart from the original form, sometimes we will tarok pisang or durian into the apom balek, either into the batter, or a small dollop placed directly in the middle of the batter during the cooking process. The sugar and/or gula melaka added can be adjusted accordingly. 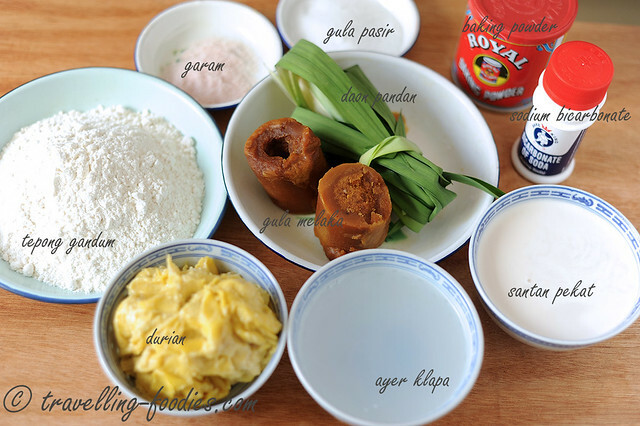 Speaking of gula melaka, please use good gula melaka for making apom balek as it takes centrestage in this kueh. To me, good gula melaka should （1）be soft to cut and even to pinch off, (2) exude a beautiful and mellow aroma, (3) taste pleasantly sweet with a sense of richness and depth, (4）have a uniform coloration when sliced through without the core looking paler. In short, good gula melaka should excite and invigorate your senses. This is something I’d said over and over again, in my pengat pisang post, as well as my precious apom balek post. For me, using a well seasoned acuan i.e. mould is pivotal in making good apoms, be it apom berkuah or apom balek. Having made apom berkuah countless times by now, I’m glad that my mould is well used enough for another batch of apom balek. 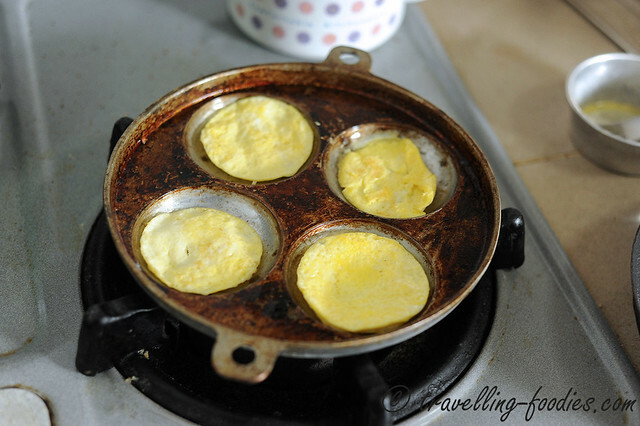 An old trick used by the bibiks to ensure that the mould is well greased, is to fry some “telor dadar” in the cavities of the mould. If these mini egg omelettes come out clean and beautiful, the mould is ready for a round of apom balek making. Flame control is of paramount importance in the making of apoms. In the past, a dapor arang api i.e. charcoal stove was used, where the mould was placed above bare cinders. Now with the hob, flame control gets a bit more tricky instead. So one has to experiment with one’s own stove flame to get the best apoms out of them. When the batter starts to produce bubbles that break on the surface, it is a good sign that the baking powder and bicarbonate of soda in it are doing their job. The acuan is then covered with a brass lid which has been preheated separately, helping to accelerate the cooking process of the surface of the apoms. The last thing that one wishes to bite into, is an apom balek with burnt bottoms but the surface remains gooey. As with many Peranakan kueh chuchi mulot, perfection comes from practice. For bibiks and nyonyas who made these so frequently to entertain guests or enjoy amongst themselves over sessons of main cherki, kueh making was deemed a necessary skill which all decent nyonyas should have. But as we progress over time and modernity steps in, what was taken for granted becomes something of an “artform”, running thin within the community and is thus much treasured. And that is precisely what this blog hopes to do, preserving the skill of kueh making and creating an awareness for the beauty of it. In a cooking pot, add coconut water, sugar, gula melaka, salt, pandan leaves. Heat to melt all the gula melaka, sugar and salt. It is not necessary to bring the mixture to a boil. Once everything have melted, turn off the flame, set aside and allow it to cool down completely to room temperature. In a large mixing bowl, sift in flour, baking powder and baking soda. With a balloon whisk, mix the dry ingredients uniformly and set aside. Once the gula melaka syrup has cooled down thoroughly, pour it over a fine-wired sieve directly into the mixing bowl with dry ingredients, in small quantities, stirring gently with each addition. Do not mix too fast to work up the gluten from the flour. 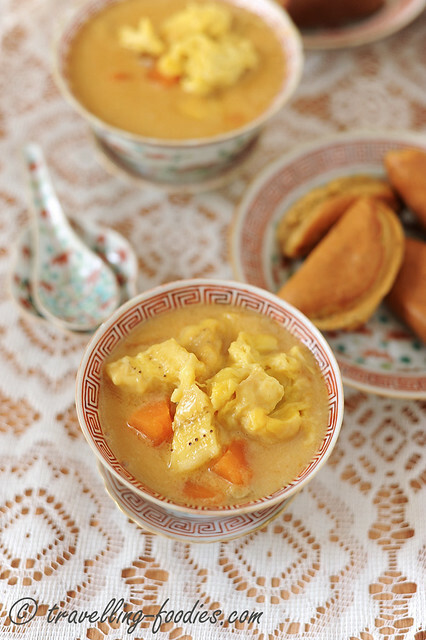 Once the flour mixture forms a slurry, add in the coconut milk followed by durian pulp and stir well to homogenise. Set aside the mixture for 30 min or so covered. To prepare the mould, first heat the mould over medium flame and thoroughly grease each cavity with some oil. Crack an egg in a small bowl and beat it slightly. Pour the beaten egg into each heated cavity. Fry the omelette on both sides and remove. The mould is now ready for making apom balek. Once the mould is well heated and greased, turn the flame down to as low as possible. Give the batter a final gentle stir to dislodge any flours which may have settled at the bottom of the mixing bowl, and scoop spoonfuls of batter into each cavity until 3/4 full. Meanwhile, heat the brass cover over another hob. 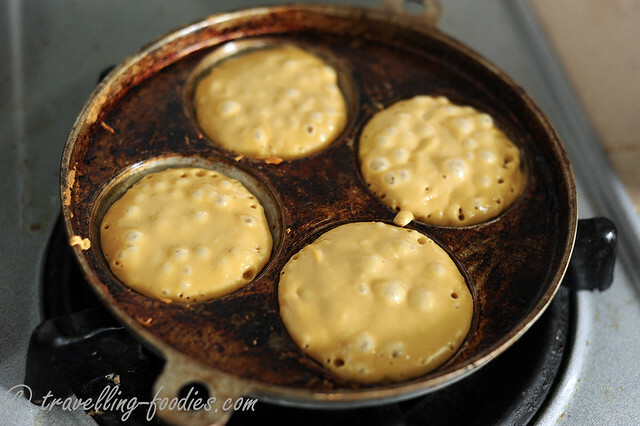 Once the surface of the batter starts to bubble, cover the top with the heated cover. After cooking for about 1 min or so, remove the cover. the surface of the kueh would have dried amply. If not, cover for another 30s or so. When the apom is cooked, dislodge it from the cavity with a skewer. It should not stick to the bottom of the cavity. Proceed to fold it in halves with a wooden spatula. Remove the apoms from the cavities. 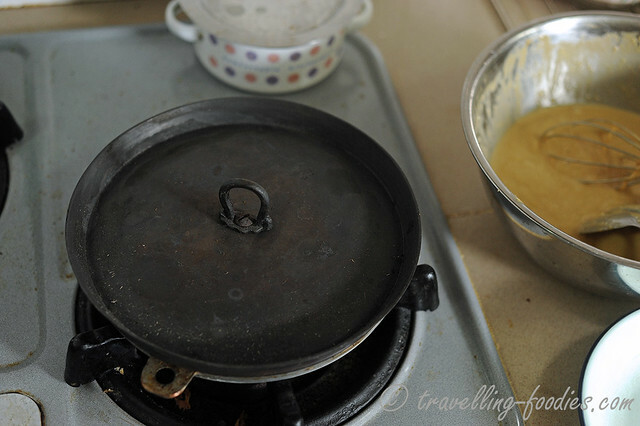 Repeat the process for more batches of apom balek until all the batter is used. Please stir the batter before each batch to ensure that the batter is well homogenised. Enjoy the apom balek with some kuah santan or serikaya, or they are good enough on their own! I love eating my apom balek with pengat durian! This entry was posted on July 29, 2015 by Alan (travellingfoodies). It was filed under Food, Simple Eats and was tagged with apam balik, Apom balek, Baba, baking powder, chuchi mulot, daon pandan, daun pandan, durian, gula melaka, kueh, Nyonya, nyonya nonya, Pengat Durian, Peranakan, santan pekat, straits chinese. Hi, I love your mould. Where can I get it? If you are in Singapore, you can try baking shops like Ailin Bakery near Paya Lebar MRT. Traditionally, hot charcoal was placed on the top of the brass cover to provide heat to cook the top surface of the kueh. Since using a charcoal stove is a rarity now, we use a gas stove/hob for the same purpose. Thus the cover has to be heated over another hob for the copper to gain heat to a high temperature sufficient to cook the top of the kueh like what hot charcoal would do. Hi Alan, what is the difference between this recipe and the recipe from 2012’s post? is there difference in texture, taste, etc? Hi Alan, my late grandma would make this with banana or with the not so good durians. My cousin who married a ‘Cheena gerk’ (and therefore not acquainted with such treats) declared to my grandma’s delight, ‘best kueh in the world!’. Thanks for this post, I made it tonight (with slightly less sugar) and all at home thoroughly enjoyed it! I halved the durian flesh for the batter and served it as a filling, also served it w pisang pengat and last but not least, my kids tried it with a dollop of vanilla ice cream as a filling between 2 apom!